This morning, at 8:55 the Today programme held a discussion between Mark Camley, chief executive of Royal Parks and Simon Jenkins, columnist for The Times, on the importance of parks, and the impact of the Olympics on Greenwich and Blackheath. Fancy a pen and ink illustration of Hogwarts? Someone’s flogging a page from an 1856 issue of The Illustrated London News on Amazon, for the princely sum of $21.75 (or £20.42 in old money, including shipping). I was wondering why Darryl had made such a long and complicated description of the electoral boundary changes – why not just upload a map? Surely the maps outlining the electoral boundaries must be held in public, and be freely distributable? Well, not exactly. 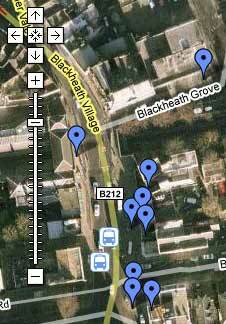 There’s this wet blanket of a site, from Ordnance Survey (friends of the Free Our Data campaign). Good luck with zooming out. And you’re not allowed to view more than one constituency at a time… But why on earth would you want to do that? Ridiculous. And who paid for the creation of these maps? You and me (and probably your great-grandparents, come to think of it). You are also not allowed to reproduce them. Unless you’re in Sweden and have a rather more relaxed view of copyright law… Someone appears to have uploaded a map showing the old boundaries around Blackheath in blue, and the new ones in red. Unchanged bits are in purple. Here’s a list of recommended links about the Olympic Planning meeting held tonight in Woolwich Town Hall. 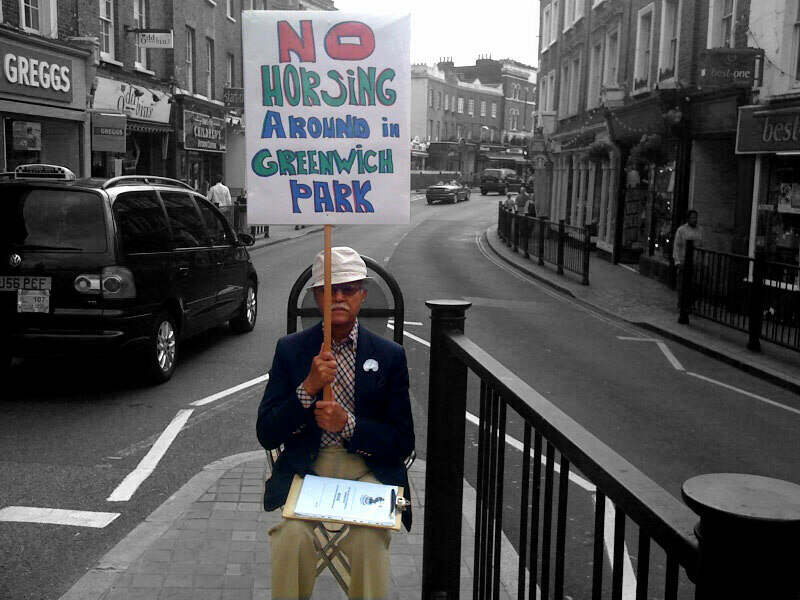 UPDATE: Greenwich Council have voted to allow the equestrian events to go ahead. Ten votes for, and two against. Up to the minute tweets from AdamBienkov and Darryl1974, pints of Guinness notwithstanding…. Conservative councillor for Eltham Nigel Fletcher also present, but not tweeting currently. Also nothing on the NOGOE twitterfeed since 2pm. Grauniad article London Olympics row over Greenwich Park role reaches climax talking about the people and organisations involved. Greenwich Green Party article written by Darryl1974 (rightly) criticising the appalling Greenwich Time “newspaper”. David Starkey’s letter to The Times, as also mentioned on the NOGOE website. My view? The Olympics in Greenwich are inevitable. It will go ahead. If a million people walking through the streets of London can’t stop the Iraq War (yes, I’m looking at you Nick Raynsford), then a few angry locals can’t stop the Olympics from knocking down some trees in the park. But I’m not suggesting that these actions are pointless. Thanks to these protests, officials will now have to treat the park and the heath with additional respect, and will have to work harder to prove the benefits to the local community than they otherwise would have. 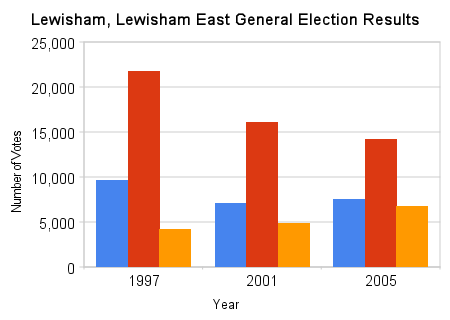 Here are some graphs showing past general election results around Blackheath. If you’re not sure which area you’re in, you can use theyworkforyou.com to find out. It’s really easy, just enter your postcode in the “Your Representative” box. These numbers were from http://www.election.demon.co.uk/1997LB.html which seems to be the only place to find this sort of info?! 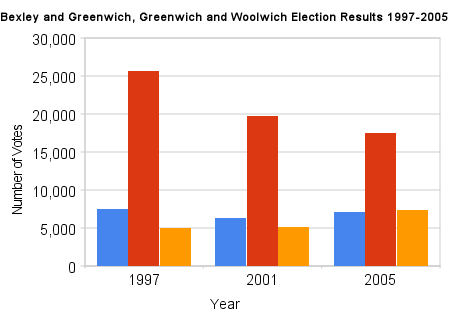 Note that these graphs only show the top 3 parties in each year, and show the number of votes, not percentages of votes. Also note that these numbers are for General Elections (MPs) not local elections (councillors). Hello. Just a quick post to find out who’s been knocking on your door lately. Alex Grant (Labour councillor for Greenwich) appeared at my door last week. Unfortunately I was hungover, grumpier than usual, and whilst was quite happy to talk about the local council, started to see red when he asked me about how I would vote in the national elections. I said I really didn’t know, and that whilst I’d always voted Labour in the past, I simply couldn’t bring myself to vote for an MP who was in favour of the Iraq War, in favour of Trident, for ID cards, etc, etc. When I claimed that Nick Raynsford spends a disproportionate amount of time talking about property development in the house of commons, this was disputed. I pointed out that I regularly look at what Mr Raynsford is speaking on, by using theyworkforyou.com, and I think you’ll agree there is a fair amount about property development, and not so much about our ridiculous privatised rail system. I have no idea. I haven’t seen Clive Efford at my door (he’s the MP for Eltham, with Labour – although you’d have to look very carefully at his website to spot it). And I haven’t seen Nick Raynsford either. 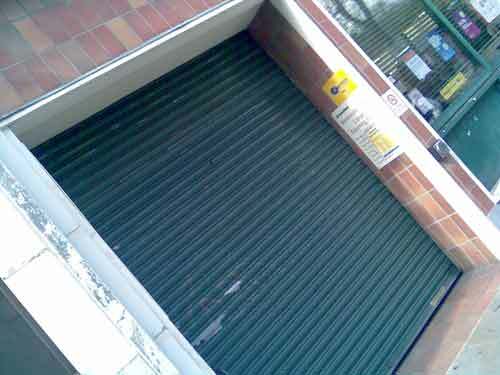 So, at the risk of opening the floodgates of political ranting – who’s been knocking on your door, and how were they? If you’re not grey, where are you? I know that you use the library.. .I’ve seen you! I haven’t felt so young in a while… If you’re a thrusting young professional™, who likes the local library, then where the hell were you? Seriously – that meeting was packed, but barely a soul there was under fifty. Which is fine, but it was a week night – a Tuesday for god’s sake! You can’t all have been at Pilates?! Anyway… Despite the curious demographic slope, the meeting was an interesting affair. Read on to the full thing, but also, please email se3villagelibrary@yahoo.co.uk to sign up for their newsletters. I’ve scanned the one from the meeting (PDF file here) – I’ll take it down if anyone objects.